In the morning we reassessed our work. The steel tubes seemed a little small compared to the size of the concrete hull. Would the single additional bracing bar between the gunwales be enough to resist the inward thrust of the water? At least the crack appeared closed. With the addition of a large styrofoam block held in place by a sheet of steel lathe, we were pretty sure that the canoe wouldn’t end up at the bottom of the lake. That uncertainty about the safety of the canoe is really the allure of the concrete canoe competition for me. It’s really the best test of an engineer’s real-life moral obligation to the health and welfare of the public. In this case, you must be willing to send your friends out on a makeshift watercraft in frigid spring waters. It takes some confidence or strong nerve to send out the team for that first race. The start of race day was typically slow. All of the canoes were hauled down to the beach-head and inspected by the judges. Next, they were placed in the water one-by-one for the submergence test. If the canoe doesn’t float back up to the top, then you can’t race. We passed the “safety” inspections with flying colors. The two woman slalom was the first scheduled race of the day. Two of the team’s senior members volunteered to steer the ship or go down with it. The start was predictable, while the other teams had a quick start, our canoe, weighted with extra pounds of steel, was slow out of the gates. The race went on, and we continued to lose ground. Despite a staggered start, we were even passed by a later team. What was going on? The canoe seemed to be out there forever. Some quick thinking by a team member was to wrap the crack with cellophane. One entire roll should do. Another brave set of paddlers took out the canoe for the next race. They came back much drier, but still far behind the leaders. At this point, we were just in it for fun and to make a statement about ingenuity. The team completed every one of the days events. 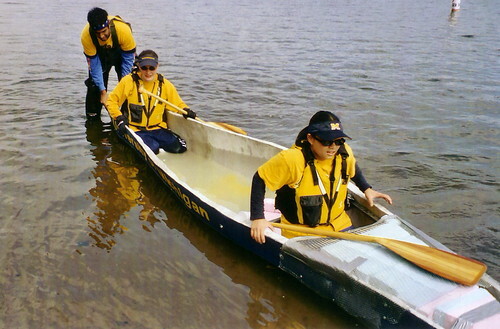 At several points, they stopped to wrap additional portions of the canoe. 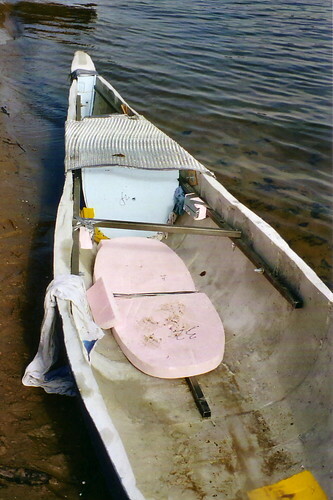 Nevertheless, the make-shift repairs were sufficient to allow the canoe to float even during the four person sprint. 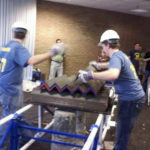 In my opinion, the event was a stunning achievement of ingenuity and teamwork. Do you have a favorite concrete canoe story? Did your team’s canoe fall apart on the way to the competition? How did your team deal with that adversity? Please share your stories below.